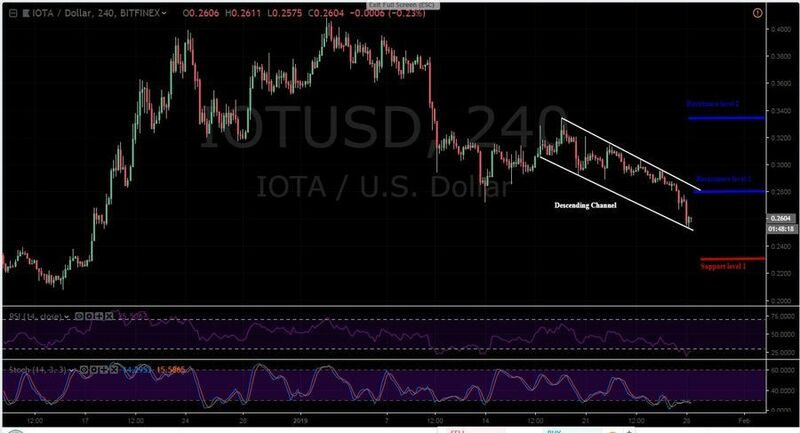 Following IOTA market: as the Dollar pair maintains a descending channel trend, the Bitcoin quote constructs a descending wedge. Obviously, its markets are crashing. 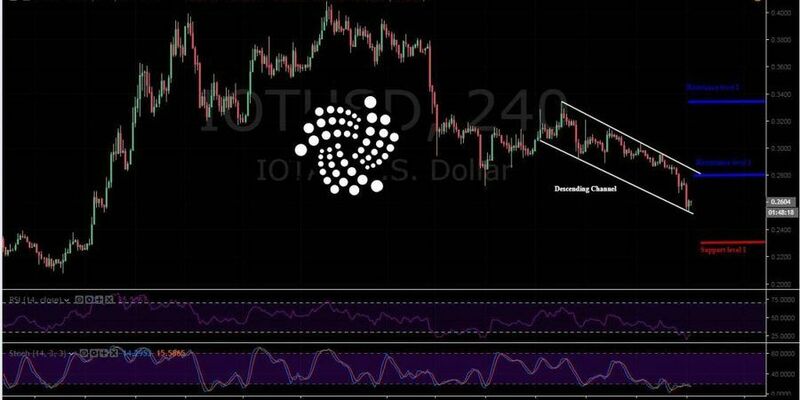 With strong bearish candles, the last ten days massive drop has positioned IOTA in a decline. The impulsive move which lasted to $0.28 (support now resistance); closing on a wick (pin bar) and retraced to $0.33 before bouncing back low. Today, the trend is maintaining a descending channel pattern. The candles have touched the lower trend line as shown at the oversold region of the RSI. A potential pullback is actually going to take price up to retest $0.27 resistance level 1, where the top channel lies. Then the rally continues to the next support at $0.23. If price fails to swing lower at the aforesaid resistance level, the high move would visit the $0.33 resistance level 2. Currently, on the Stochastics, the market pressure is exhausted at the oversold. 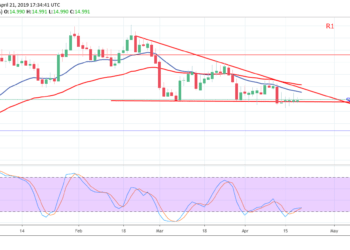 After recording 0.0001 BTC early this month, the price fell to a current low at 0.0000715 BTC near the lower trend line; now preparing for a pullback to 0.0008 BTC resistance level before resuming the existing rally. See buying pressure on the Stochastic as it prepares to leave the oversold region. 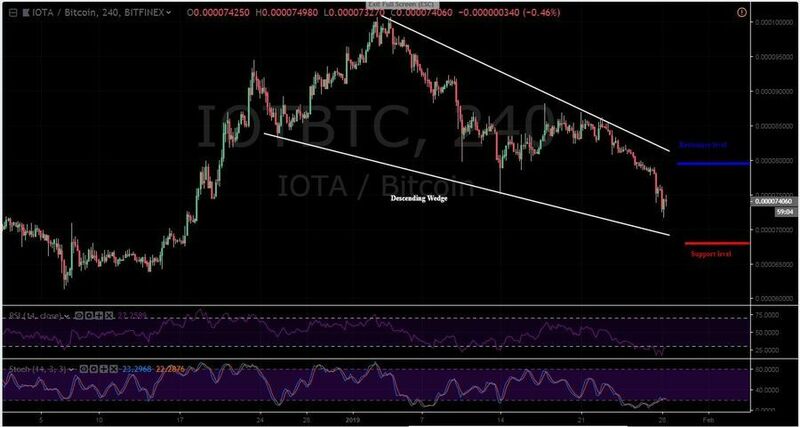 Pairing Bitcoin, the Medium-term trend is in a bearish as IOTA moves in a descending wedge pattern. The price in driving to 0.000068 BTC support level. Breaking this support would shoot price lower to 0.00006 BTC support area, the 2018 low. On the RSI, the trade has actually reached the oversold territory. Leaving the oversold is likely to position trend in reversal. That is if the 0.00008 BTC and 0.0001 BTC resistance levels are surpassed. IOTA team did a tremendous job with its latest developments and solutions for the community. For example, on December 17, 2018, IOTA introduced its native podcast named ‘UNTANGLED‘ aimed to explore the many different use cases of the Tangle in the real world in a tangible way for real people. More on top, on January 2, 2019, IOTA introduced the next generation private chat app CHAT.ixi. What’s interesting about this release is that in CHAT.ixi there are neither rules nor moderators who enforce them, no ads, just you. It is permissionless Chat app on the IOTA Tangle. These mentioned developments are just a small number of what IOTA team has actually achieved in the last few months. 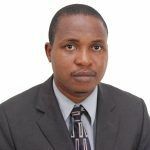 However, at the moment, cryptocurrency markets are too speculative to reflect the real value of such projects as IOTA.